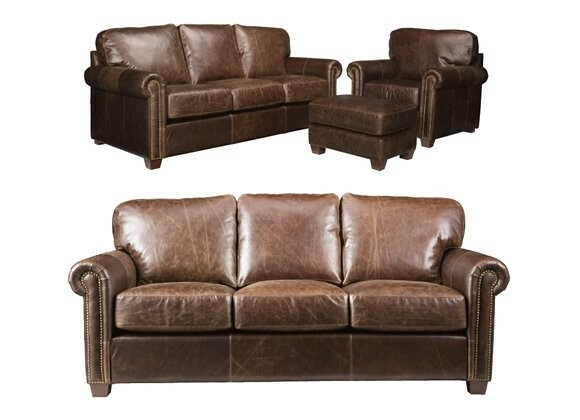 Leather Restoration Company offers top quality leather furniture with value pricing. Come see our showroom in Waukesha Wisconsin, we are located at 401 Madison Street at the corner of Madison and North Street. We carry all types of leather furniture such as leather sofas, leather sectionals, leather chairs, leather curved sofas, leather angled sofas, leather home theater seating, leather ottomans, and more. Our leather furniture is made with the finest Italian tanned hides available. The only difference is a slightly lower selection of hides can be used here. A slight protective finish ( usually micropigments)is applied by roller or in the tannage to give the leather some serviceability. These leathers are processed a little more, first by aniline dying in large drums like the leathers above, but then also finished on top. Spray pigments of color are applied to the tops of the hides to even out the finish and camouflage natural occurring imperfections. These leathers are light resistant and scratch resistant and are easily cleaned. The next 10 - 15% of the world hide supply fall in this category. "B"grade hides meet this criteria. Just as the grain, texture and markings of wood should reveal the nature of the tree from which it came, leather should display the natural markings and grain characteristics of the animal from which it was taken. The best upholstery leathers are clear, clean, and supple. They are also dyed through with transparent aniline dyes. The full natural grain is retained and they are called "full grain leather." Cheaper leather have the natural or genuine grain sanded away and an imitation grain pressed or embossed into the surface.They are stiff and "boardy" with a heavy coating of pigmentation to cover up imperfections and they look and feel much like plastic.The better the quality of hide or skin, the less it has to be treated.The natural grain variations should be exposed. One should see the "fat wrinkles" and the feel, or hand, should be supple and natural to the touch. So when choosing your leather, make sure it looks natural, smells good, and has a soft hand. Inspect your leather carefully. Make certain that it retains the full natural grain. Full grain leather is the best quality! The most confusing term used in the furniture industry is the term "top grain". It can be a contradiction because it often implies what it is not. "Top grain", is the definition that is generally used when the grain is not genuine: when the real grain is sanded away and an imitation grain is stamped into the leather. When the genuine grain remains, the leather is called, "full grain", or "full top grain", not simply "top grain." Top grain is a generally regarded as a economy leather!